Wow, what a ride it has been, during the initial four issues run of the best all ages comic to ever exist, yes, I am referring to Action Lab Entertainments Princeless. The final issue of book one finds Adrienne and Bedelia with their hands full, in the midst of a heated battle between some guards from the castle. The duo is forced to retreat as the numbers become to many, setting into motion what is sure to be a amazing adventure featuring two of the strongest female characters to ever be created. 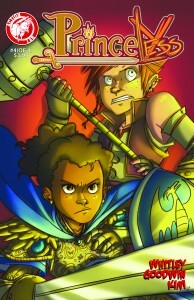 Anytime a fellow comic fan with a kid asks me about comics to start the young ones out with, my first response is always Princeless, while it is geared heavily towards female readers it is also very enjoyable from a male point of view and in turn instills a sense of equality early on. From start to finish this series has been non-stop entertainment, it has its moments of humor, tension, action, and in this issue even a good amount of emotional drama. I have always respected the fact that the series is an easy read, but at the same time is very intelligently written. Much like other issues, this one also features a nice tip for youngsters in the form of what to do incase they smell smoke, its small details like this that make this comic far superior to similar all age series. Issue #4 was the perfect way to conclude the first run of the series, and has me counting the minutes until the first issue of the next book is born. Adrienne is one of the best new characters I have been exposed too, with the addition of the equally strong willed Bedelia as a main character, and this series is sure to be moving in a very interesting direction. The final pages of the issue really give you that sense that you are in store for a very memorable journey. 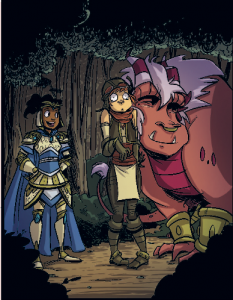 I’d also recommend this series to D&D fans that enjoy a good parody of the fantasy genre, there are a lot of little details hidden in this issue that made me think back to late nights of rolling dice and consuming large amounts of junk food and caffeine. 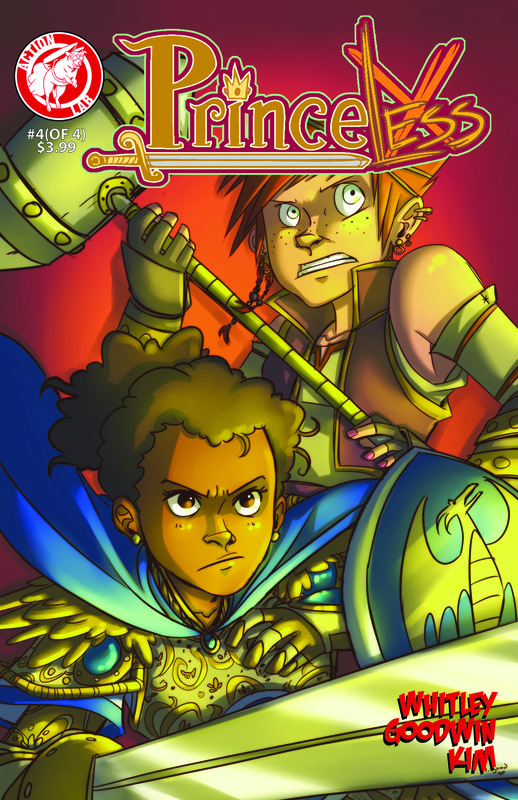 Princeless truly is one of those pieces of all age’s media that authentically can be enjoyed by all ages, I have been referring to it lately as the Skrek of comic books. If you have not jumped on the Princeless train just yet, I do not know what you are waiting for, this is a comic series you do not want to miss. I know I have said this about many Action Lab Entertainment creations, but once again, this would make a perfect animated series. With Saturday morning cartoons mostly dead, beyond endless streams of Pokémon clones, this would be a great series for a generation of kids desperate for some entertainment that works their brains and imaginations instead of simply trying to coax money out of their parent’s bank accounts.